P2X7 antagonism: a specific tool to decrease inflammatory status in human atherosclerotic vessels? Atherosclerosis is a dynamic progressive disease of the large arteries characterized by the tendency to accumulate lipids, inflammatory cells, smooth muscle cells and extracellular matrix within the sub-endothelial space, and progressing in unpredictable way to different stage. Rupture or erosion of atherosclerotic plaques (PL) ultimately leads to ischemic events such as myocardial infarction and stroke, associated with high disability and mortality burdens worldwide. The imbalance between synthesis and breakdown of extracellular matrix components, through facilitating both migration of proliferating cells in the site of lesion as well as the thinning of atheromasic fibrous cap, plays an important role in the plaque progression versus instability and it increases the possibility of rupture and thrombosis. Highly inflamed PL show elevated matrix metallopeptidases (MMPs) activity. In particular, high matrix metalloproteinase-9 activity is detected in unstable carotid PL (CPL). MMPs activation or release from circulating cells involves activation of the purinergic receptor channel type 7 (P2X7), a ligand-gated cation channel activated by extracellular adenosine triphosphate. P2X7 on circulating cells possibly participates in the trigger/propagation of coagulation in healthy and atherosclerotic vessels, and it contributes to tissue factor-dependent thrombosis in mice. The functions of this receptor are broad and partially unknown, but its pathophysiological role in the progression of atherosclerosis has been postulated. Compelling evidence has been published implicating ATP-triggered P2X7 pathway in the IL-1β processing/release, mediated either via microvesicles or lysosomes. P2X7 is more expressed in CPL than in non-atherosclerotic arteries. We hypothesized that P2X7 plays a role in the IL-1β-dependent regulation of MMP9 and ultimately in the modulation of CPL destabilization. We investigated the modulation of interleukin 1 beta (IL-1β) release and of MMP9 generation through acting on P2X7. P2X7 and the related vascular profile (IL-1β, NLR family pyrin domain-containing 3, caspase-1 and MMP9) were characterized. The effects of P2X7 antagonists (A740003, KN62) and MMPs inhibitors (Batimastat, Ro28-2653) were studied in ex-vivo tissue cultures of human CPL vs. non-atherosclerotic internal mammary arteries (IMA) by using molecular biology, immune-biochemical and microscopy methodologies. We highlighted atherosclerosis-related differences between CPL and IMA molecular patterns, and their responsivity to P2X7 antagonism. All the P2X7 isoforms (54kD, 75kD and >100kD) were detected in variable extent in CPL, but only P2X7 at 54kD was found in IMA. Scattered P2X7+ cells along the lumen and traces of signal in the walls were observed in IMA by confocal microscopy, while P2X7 was detected at luminal site, into both neointima and media of CPL, with granular pattern in αSMA+ and CD68+ cells, as well as in the surrounding interstitial space. IL-1β gene and protein were detected in CPL tissues, absent or present in negligible quantity in IMA, and in all the culture supernatants. High IL-1β tissue content was associated with presence of calcified nodules underneath a thin fibrous cap, and features of instability/vulnerability in CPL. MMP9 content and gelatinolytic activities were higher in extracts from CPL than from IMA. CPL also released a greater quantity of MMP9 into culture supernatants than IMA. We provided evidence that treatment of ex-vivo cultured CPL with A740003, but not with KN62, decreased IL-1β and MMP9 in both tissues and supernatants, independently from NLR family pyrin domain-containing 3, but in relationship with patient’s smoking status. MMPs inhibitors diminished IL-1β gene expression, but were not effective at MMP9, possibly because the assumption of statin by patients. 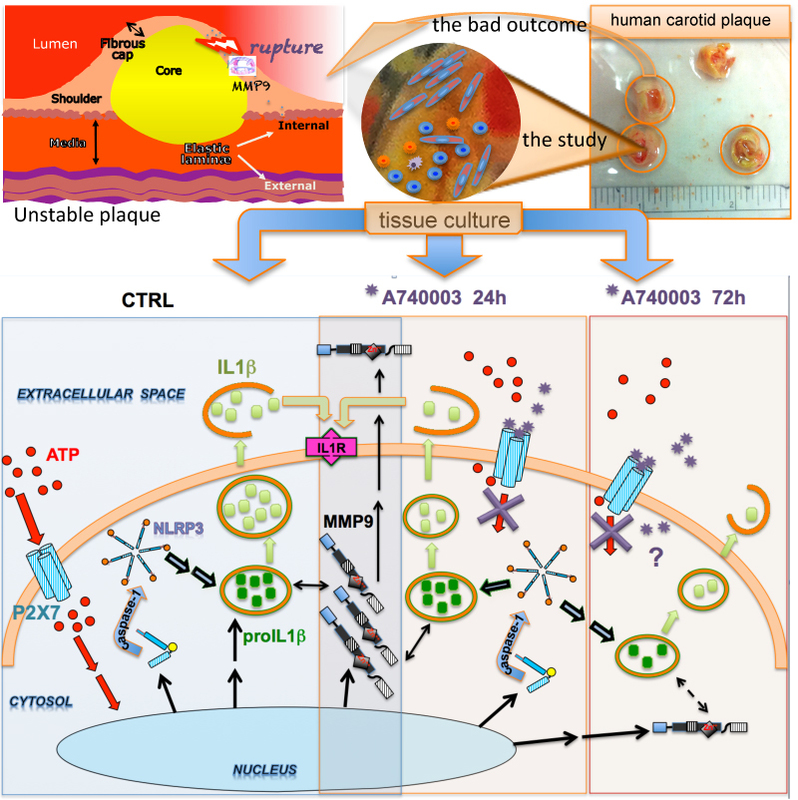 These data demonstrated the effectiveness on ex-vivo tissue cultures of CPL of P2X7 antagonist, suggesting the usefulness of A740003 as a possible specific tool to decrease inflammatory status in human vessels. These results might support the design of studies applying P2X7 antagonists for the local targeting and tailored therapy of atherosclerosis. P2X7 receptor antagonism modulates IL-1β and MMP9 in human atherosclerotic vessels.